The bodies of all 10 sailors reported missing following a collision between the USS John S. McCain and a merchant vessel have been found, according to a statement from the US Navy's 7th Fleet. The guided-missile destroyer collided with an oil tanker named the Alnic MC a week ago east of the Malacca Strait. It's the fourth time a US warship has been involved in an accident in Asian waters this year. "US Navy and Marine Corps divers have now recovered the remains of all 10 USS John S. McCain sailors," the statement, released Sunday, said. 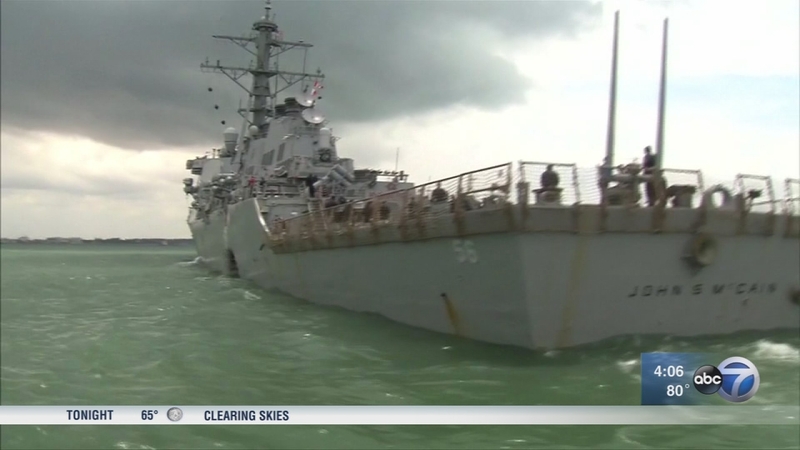 The Navy suspended its search-and-rescue operations Thursday, although divers continued recovery efforts inside flooded compartments in the ship. The 10 deaths occurred on board the ship. The mother of one of the sailors described her son's enthusiasm for the Navy during an emotional interview on CNN's "New Day." Cynthia Kimball said her son John Hoagland "loved the Navy" and "thought that the Navy was definitely the place he needed to be." "He really loved the idea and the places he got to see," she said. "He was proud of who he was and what he was doing." After the McCain collision, the Navy ordered a one-day operational pause across the entire fleet to examine the root causes of the accidents. Vice Adm. Joseph Aucoin was relieved of his duty as the commander of the US 7th Fleet, based in Yokosuka, Japan, following the incident, the Navy said in a statement. Military leaders, Congress and government watchdogs have all warned for years that the military faces a possible readiness crisis as it has slashed training and maintenance to keep up with budget cuts and increased operations around the globe, and the McCain collision has sparked a new round of questions about the Navy's readiness and training. "I think it's probably approaching a readiness crisis," Rep. Adam Kinzinger, an Illinois Republican and Air Force veteran. "You have, in many cases, a Navy that is highly operational and may not get the time or the chance to train as deeply or as much as they want. "You have old equipment. You have failing equipment because it's not being repaired or invested in. These are all concerns when it comes to this."